PRAIRIE DU SAC, Wis. – Breeding a champion is a dream many involved in livestock enterprises can appreciate, regardless of the species. 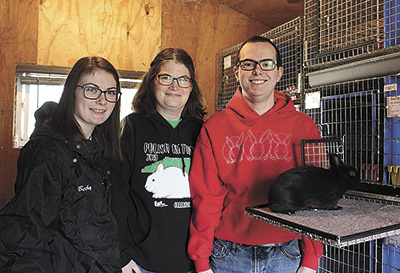 For Becky and Riley Breunig and their mother Danielle Breunig, that dream became a reality last month when their home-bred Polish rabbit, Chewy, took home national champion honors in the youth division at the 2019 Polish Nationals Show March 23-24 in Greensboro, N.C. Animal enterprises are not something new to the Breunigs, who live in Prairie du Sac, Wis. Danielle grew up on a dairy farm and was involved in showing cattle, an interest she passed on to her children. “I showed as a kid, and I got the kids involved with it,” Danielle said. After growing up showing dairy cattle, Becky is in the process of starting her own dairy herd, milking a small group of registered Brown Swiss and Jerseys cows, raising calves with the milk. The Breunigs began their rabbitry about eight years ago when Becky and Riley decided they wanted to show rabbits at their county fair. 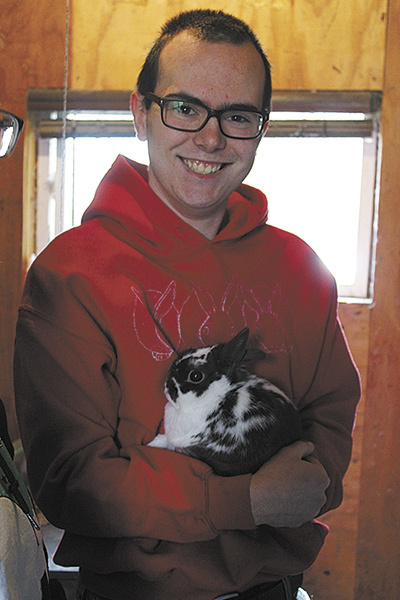 They started attending other shows in the area, and what began as a pet rabbit project has grown to nearly 40 rabbits. In addition to exhibiting their own animals, they sell rabbits for both show and pets. The Breunigs had purchased both of Chewy’s parents. Chewy began to show signs of good conformation, and the Breunigs decided he would be a rabbit they would keep and add to their show group. When he was about 3 months old, they exhibited him at his first show. Breed standards for Polish rabbits have an ideal weight of 2.5 pounds, and allow for a maximum weight of 3.5 pounds. They are best known for their large, distinctive eyes. There are six accepted varieties in the breed, including black, blue, chocolate, ruby-eyed-white, blue-eyed-white and broken patterns. The Breunigs have all varieties of Polish rabbits with the exception of the blue-eyed-whites. Chewy is 3 years old and competes in the senior buck division of the black breed variety. He is registered and granded within the national breed organization. In order to become granded, the rabbit has to earn points by competing and winning at qualifying shows. Each win at a qualifying show earns a leg, with three legs being required to earn the title of being granded. No stranger to show ring success, Chewy has earned 34 legs, as well as winning a best in show certification twice. This year’s appearance at the Polish nationals was not his first time competing at that level. In 2017, he placed second and was third in 2018 before coming back to win this year. In addition to Chewy, the Breunigs took five rabbits to the Polish nationals that all placed well, including a broken pattern senior buck that placed third in his class. Each year, the Breunigs attend 10 to 15 shows, primarily in the upper Midwest. The larger shows sometimes have over 100 youth and 200 open entries. Becky has an interest in obtaining her judging credentials to begin judging rabbit shows in addition to exhibiting. Competing at rabbit shows is different from exhibiting at a dairy cattle show. The Breunigs enjoy the laid-back pace of showing rabbits, saying there is not a lot of preparation work for shows, particularly with the short-haired Polish breed. All of the rabbits in the Breunig’s rabbitry eat a diet that consists of a Purina show pellet, black sunflower seeds, along with steam-rolled barley and Calf-Manna. Each rabbit eats about a one-half cup of the mixture daily and receive hay occasionally. When the time comes for their class, the rabbits are placed in a box or cubby before the judge. The judge evaluates each rabbit without the owner present. According to the Breunigs, this can help cut down on judges playing favorites but can add a level of suspense to the show for the exhibitors. The Breunigs recalled the emotions they experienced while watching Chewy’s evaluation by the judge, waiting to hear the results. While winning the black senior buck class was big, Chewy one-upped himself when he was named the best of the black variety, advancing to the competition for best of breed.